In the Appalachian Mountains, a train hustles past snow-covered towns, chugging toward the eastern seaboard with 3 million gallons of crude oil in its tank cars. From the front window of a house in the West Virginia valley town of Boomer Bottom, a grandmother, son, and granddaughter take in the distant view of the moving train as it winds along the base of Mount Carbon, just above the icy Kanawha River. The 109-car train, hauling Bakken oil fresh out of North Dakota’s 21st-century oil boom, seems to be moving around the mountain as easily as all the other trains that regularly crisscross this patch of West Virginia coal country. Then, suddenly, something goes wrong. The family looking out the window is stunned as they watch the tank cars tumble off the tracks toward the river, one careening into a house and instantly igniting it. Then, BOOM! Massive fireballs billow upward into orange mushroom clouds from the tangle of train cars. The family scrambles to evacuate, along with everyone else in the valley whose Monday afternoon has been interrupted by the explosive accident. “You can’t delay and hang around, saying, I’ve got to get my dog, I’ve got to get my toboggan, I’ve got to get my purse,” the grandmother later told the Pittsburgh Post-Gazette in an interview for an article on the February 2015 train derailment that caused oil-fueled fireballs to shoot higher than the coal mountains for at least 24 hours. Fortunately, there were no fatalities. Oil and coal. The ancient fossil fuels have played a major role in powering the nation’s industrial might, enabling its two-car family lifestyle, and swiftly evolving the electronics of the Information Age. Yet in the year of 2015, we’re still dealing with the side effects: explosive train derailments, dead dolphins washing ashore five years after the Deepwater Horizon oil spill, dozens of gas-fracking-induced earthquakes in Oklahoma and Texas, coal mine collapses, air pollution, water pollution, climate change. The energy conundrum was supposed to have been fixed decades ago, partially through an energy source even more ancient than fossil fuels—sunlight. In 1954, Bell Telephone Laboratories held a press conference where scientists revealed the first silicon solar device for powering telephone communications and demonstrated the new technology by using it to spin a toy Ferris wheel. In 1958, the first spacecraft with solar panels was launched. President Jimmy Carter had solar panels installed on the roof of the White House during the energy crisis in the 1970s, demonstrating the promise of this environmentally friendly energy resource. Although solar power has been seen as a panacea for the energy enigma, it hasn’t yet become an elixir. Up until a few years ago, the high cost of investing in solar panels was the primary barrier to widespread adoption. But that is changing. Policymakers, engineers, and research scientists are all contributing to a revival in harnessing energy from the sun. Solar power is now the fastest growing source of new electricity in the United States, representing one-third of new electricity being added to the grid. In another river town on the edge of Appalachia, a chemist has been experimenting with unusual ways to advance solar power, exponentially beyond the common solar panel. If he is successful, his discoveries could have significant implications. Stefan Bernhard, professor of chemistry at Carnegie Mellon University in Pittsburgh, is investigating methods for creating solar fuels. Rather than using the sun to generate electricity (that’s what solar panels do), he’s devising ways to use the natural energy in sunbeams to ignite chemical reactions that can produce fuels such as hydrogen. As a clean-burning fuel, hydrogen releases only water rather than carbon dioxide when it runs through engines, and it could propel all sorts of just-around-the-corner green technologies. The idea behind solar fuels is to mimic photosynthesis in plants, Bernhard says from his laboratory in the University’s Mellon Institute, which is often bathed in a glow of green and blue lights during experiments. Since primordial time, plants have followed the photosynthesis recipe for cooking up energy from the sun. Plants absorb sunlight and use the radiant energy in that light to drive reactions that pop out energy in the form of carbohydrates to feed the plants and grow fruits. In the photosynthesis recipe, explains Bernhard, after CO2 and water have been gathered, the next step involves the absorption of two photons (tiny particles of light) and the liberation of oxygen and electrons from water. These electrons are then added to CO2 to produce sugars. But CO2 conversions are difficult to replicate. In the lab, replacing this step with the comparably less complicated reduction of water triggers the production of hydrogen, which is useful as a clean fuel for turbines and fuel cells. Chemists long ago figured out how to replicate water-splitting with light on a simple level. The challenge is that water-splitting in the laboratory can take a lot of time, and it’s not very efficient. So Bernhard has been laboring for more than a decade to create chemical substances called catalysts that can be added to the recipe to speed up the water-splitting reaction. His findings have influenced hundreds of scientists and experiments. Last year, for example, one of his findings was named among the top 20 most cited concepts of the past 20 years. The recognition from Chemistry—A European Journal was for a 2006 paper he published in that journal on using iridium as a catalyst. About one-third of the scientists who have cited the paper did so for research on solar energy, Bernhard says. Another popular paper is one that has been cited more than 200 times since its publication in 2010. That paper, coauthored with fellow Carnegie Mellon chemistry professor Terry Collins and other colleagues, explains the properties of an iron catalyst—originally created to turn harmful compounds into less toxic substances—that is also pretty skilled at speeding up the chopping of water molecules, thus contributing to the ongoing research for solar fuels. and women have cooked up simple stews over the centuries. Take the case of birds and airplanes, for example. “A bird flies completely differently than an airplane,” he says during a phone call from an airside terminal in Boston, where he awaits a flight after presenting his latest catalyst findings at the 2015 meeting of the American Chemical Society. Not only are birds’ acrobatic flight skills more sophisticated than the fanciest of jets, but birds proportionally consume far less fuel. “The bird is extremely efficient. It can be fueled by a bunch of mice,” Bernhard quips. Yet the invention of the airplane is still a human miracle. Inventing a human-designed photosynthesis process could be just as revolutionary as mass air travel, Bernhard says. Not only would solar fuels be derived through more environmentally friendly processes than oil and coal extraction, but they could power green technologies—like super batteries that could offer a solution for the use-it-or-lose-it problem with electricity derived from solar panels and windmills. The energy could be saved for use at night or non-windy days. To make catalysts feasible for mass energy production, Bernhard says, chemists will need to design catalysts that can be used again and again in water-splitting reactions. His best catalysts can do their work tens of thousands of times before they die out. Ideally, to mass produce solar fuels, catalysts will need to work millions of times over. Bernhard’s career as a chemist didn’t begin with studying the recipe for artificial photosynthesis, but with recipes for a treat his native country is famous for: chocolate. He grew up in Switzerland and started his post-secondary education with a laboratory apprenticeship at Chocolat Tobler. His taste for chemistry and hunger to learn the language of the molecular world (easier than French, the German-speaking professor jokes) eventually led him to earn a degree in chemical engineering from Ingenieurschule Burgdorf and a PhD in chemistry at the Université de Fribourg. As a student, he was assigned research projects on light absorption and the transfer of electrons, both topics that are fundamental to understanding the solar energy realm. When he was invited to work on a spectroscopy project at Los Alamos National Laboratory in New Mexico as a postdoctoral research associate in 1996, he told his wife that they’d move to the United States for a year. After their family expanded to four children and Bernhard pursued research and faculty opportunities at Cornell, Princeton, and finally Carnegie Mellon in 2009, the Bernhards have become Pittsburghers, settled into the Three Rivers region. “My career was almost orchestrated in the way that photosynthesis is orchestrated,” he says in retrospect. 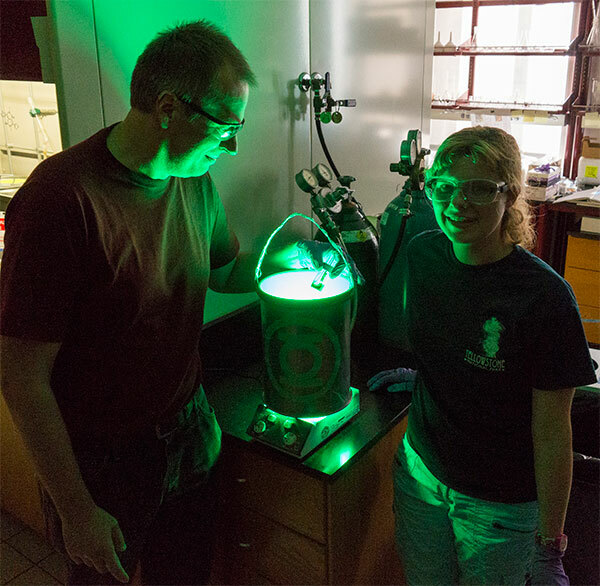 A photon-driven chemical reaction is illuminated with green light in a custom-built chemical reactor. Danielle Chirdon and Stefan Bernhard are investigating artificial systems for storing solar energy. He also has been guiding the careers of students in his laboratory. Doctoral student Danielle Chirdon holds a fellowship from the U.S. Department of Energy’s Office of Science Graduate Fellowship Program to support her research on solar fuels in Bernhard’s lab. In addition, she’s devoting some of her research time to investigating new materials for solar panels that could be even more effective than the standard silicon-based panels. The U.S. Department of Energy is leading the nation’s resurgence of solar power—through support of fellowship awards like Chirdon’s and especially through a big push to address the cost barrier of solar power. “We’re just at the tipping point now, across America, where solar is competitive with conventional power,” says Minh Le, director of the Solar Energy Technologies Office at the U.S. Department of Energy, which is facilitating the nation’s SunShot Initiative. The program, named to reflect the speed and success of President John F. Kennedy’s MoonShot Initiative, is aiming to make solar electricity fully cost-competitive with traditional energy resources by 2020. SunShot is serving as a catalyst—to use the chemical term—to speed up the implementation of solar panels across all states. Cost has been the biggest hurdle throughout the history of solar energy, Le emphasizes. When SunShot started in 2010, solar energy technologies cost about four times as much as conventional energy sources. This year, at the halfway point, the initiative has already achieved 70% of its goal. The change has been dramatic. During President Obama’s State of the Union address earlier this year, he noted that every three weeks America brings as much solar power online as it did in all of 2008. The rise has been greatest in locales like Hawaii, where conventional energy costs are already high, as well as in sunny states like New Mexico and Arizona. Advancement is being seen in New England and the South Atlantic, too. “Homeowners and businesses alike are choosing solar because it’s making economic sense,” Le says. The acceleration of solar power usage in the United States is also coinciding with the 2015 Year of International Light and Light Technologies hosted by the United Nations. Members of the U.N. General Assembly proclaimed the Year of Light as a means of “raising global awareness about how light-based technologies promote sustainable development and provide solutions to global challenges in energy, education, agriculture, and health.” Events worldwide, concluding with a closing ceremony in February 2016 in Mérida, Mexico, are celebrating the importance of light to life itself, as well as the importance of light technologies in the 21st century. As solar panels become more and more commonplace in neighborhoods, on farms, and at manufacturing plants worldwide, scientists like Bernhard will continue advancing the field beyond the panels to solar fuels and other forward-thinking ways to use the sun. The work on light-based technologies in Bernhard’s chemistry laboratory is always shining. As part of Chirdon’s PhD dissertation research, she has been studying several variations of catalysts to improve the performance of solar cells, building upon Bernhard’s well-known findings. At the lab bench during a recent experiment, Chirdon pours some of her catalyst solution into several vials of water and arranges the vials in a circular tray on a custom-made machine called a photoreactor. (Bernhard’s team built the machine back when commercial photoreactors weren’t yet available.) Then Chirdon switches on the machine’s LED lights, mimicking sunlight. Finally, she slides a metal cylinder—humorously decorated with the Green Lantern symbol from the DC Comic series recently repopularized by The Big Bang Theory—over the top of the glowing machine. During the next few hours, the LED lights and catalyst cause the water-splitting reaction in the vials of water. As the resulting H2 gas builds up, a valve in the photoreactor measures the build-up of pressure, an indication of the effectiveness of the catalyst. After the experiment, Chirdon uploads the data into her computer and prepares to analyze them before showing them to Bernhard. The results: pretty good. Was it a eureka moment? Not yet. Maybe tomorrow’s experiment will be. Tomorrow and next week and the next, Chirdon will repeat the experiment, always bathing the lab room in the green or blue glow of LED lights. Other researchers in the lab are conducting similar experiments, too. So, nearly every day in the Bernhard lab, hydrogen gas builds up in glass vials. The pressure mounts. Step by step, the chemists come closer to perfecting a recipe for solar fuels.